This post is part of my guide about how to start a blog. Read the full guide to learn all the steps involved in creating a blog from scratch. Now that you have a domain name and a web hosting plan and know which is the best blogging platform, you have reached the long-awaited moment of installing WordPress. 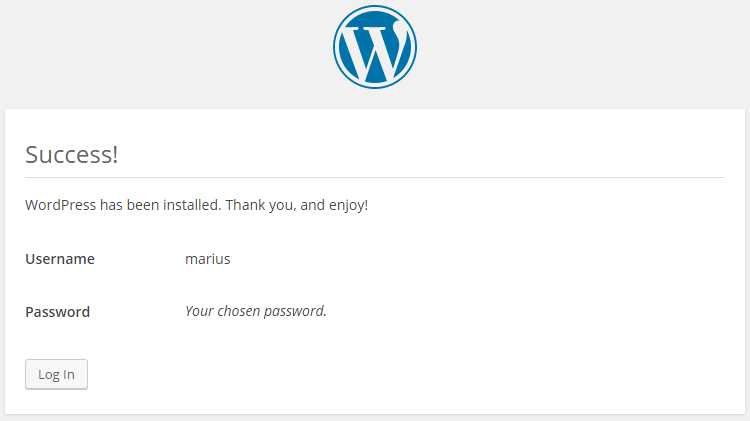 There are a few different ways of installing WordPress. Some of these approaches are easier and some of them involve a bit of technical knowledge. Since some of the methods will depend on the features offered to you by your web hosting provider and your hosting plan, I will teach you two of the most common ways of installing WordPress. cPanel is a popular software used by many of the web hosting companies for simplifying the process of hosting a website. cPanel also gives the customers a management interface and access to various tools and services required for hosting their site. If your web hosting provider uses cPanel, it’s very likely that you also have access to Softaculous or to another similar app. Softaculous is a library of scripts and applications that can be installed to your web host with only a few clicks. If your web hosting provider doesn’t use cPanel, or if your current hosting plan doesn’t include access to Softaculous or to other automated script installation library, then you will have to install WordPress using FTP. 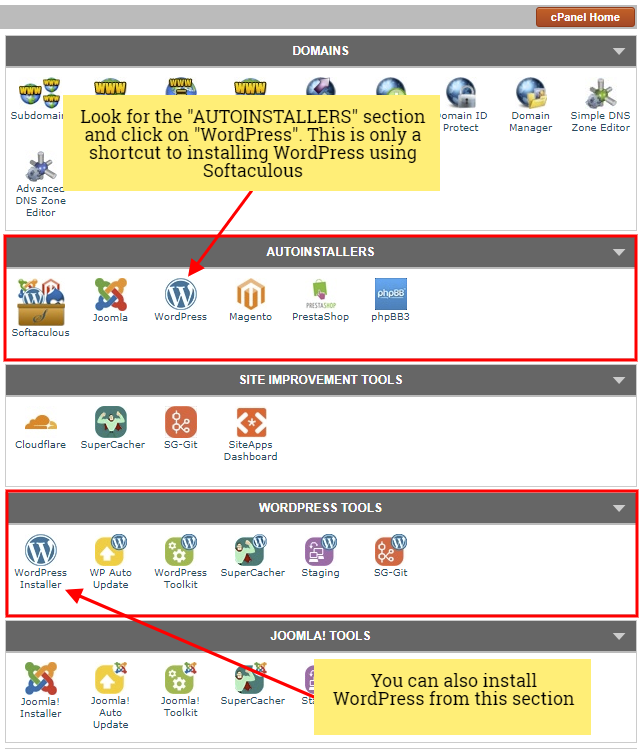 Installing WordPress with Softaculous is straightforward and very fast. This is the easiest way of installing WordPress since the installer will usually automatically create your database, upload WordPress and install the database tables with one click. 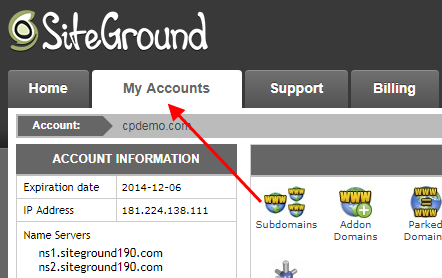 In my tutorial about getting a web hosting account, I have used SiteGround as a reference. I will continue to give SiteGround as an example since it’s my number one recommendation when it comes to choosing a web hosting company. Therefore, if you have your hosting plan from another hosting provider, what you see in the hosting management panel might not match with my screenshots. If your hosting provider also uses cPanel, then the interface should be very similar or identical with my screenshots from SiteGround. 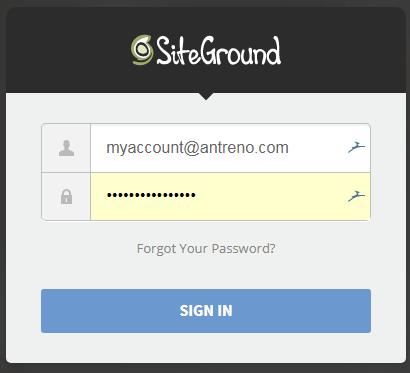 The first step is to log in to your SiteGround account. Next, go to “My Accounts” tab in the top menu. You should now see all the tools and services available in the cPanel. On the next page, should now see the current version that comes with Softaculous (don’t worry if that’s not the latest WordPress version because you can automatically update WordPress once you have your site installed), a few option tabs and an “Install Now” link. Click the “Install Now” link. On the next page, there are a few settings that you need to fill up concerning your new WordPress installation. I’ll take you through every one of them. If you have an SSL certificate already installed for your domain name, choose between “https://” and “https://www.“. If you are not sure, try that by accessing your domain name with https:// before the domain name (example: https://antreno.com). If the domain is accessible and you don’t receive a security warning from your web browser, that means your domain name has already an SSL certificate installed. Every shared hosting plan of SiteGround also includes a free Let’s Encrypt SSL certificate, so it’s very likely that your site already has it installed. Choosing between “https://” and “https://www.” is more a personal preference. If you want your site to load with “www” before the domain name, then choose “https://www.”; Otherwise, choose “https://”. If your domain doesn’t have an SSL certificate, choose between “http://” and “http://www.“. Yet again, choosing between “http://” and “http://www.” it’s at your discretion. Simply choose the domain name where you want to install WordPress. If you want to install WordPress in a directory of your website, for example antreno.com/wp, then just type wp in this field. If you want WordPress installed to the root of your domain name, leave this field empty. In this section, there are a few self-explanatory settings. In the first two options, you have to enter the title of your site and a short description. Don’t spend too much time on these since can be changed after WordPress is installed. Enable the “Enable Multisite (WPMU)” option if you intend to enable the WordPress Multisite feature. This feature allows you to create a network of sites, without the need of installing a WordPress instance for every site. Most of the people won’t need this feature. Under this section, there are a few options concerning the user account who will have administrator rights. Enter a username, a strong password made by letters, numbers and special characters and a valid email address. You can install WordPress in many of the available languages. You can also change your site’s language after installation. There are two WordPress plugins which can be installed directly with Softaculous. The first one is “Limit Login Attempts (Loginizer)“, which is a security plugin designed to prevent the potential hackers or bots from trying an endless combination of passwords in order to crack your admin account. It’s a useful plugin, but I usually use another plugin for that. It’s up to you if you want this plugin or not. The second plugin is “Contact Form by WPForms-lite“, which is a drag and drop plugin for creating contact forms. I also use another plugin for my contact form, so I don’t usually install this. You can choose to install a WordPress theme called “Layers“. I don’t know anything about this theme, so you should probably just set this option to “None”. If you choose “None“, WordPress will still install the default WordPress themes that come with the core script. Under this section, there are three options regarding the database name, database tables prefix and the backup location. There’s no need to change any of these unless you want. After you have filled up the required information, click the “Install” button from the bottom of the page. 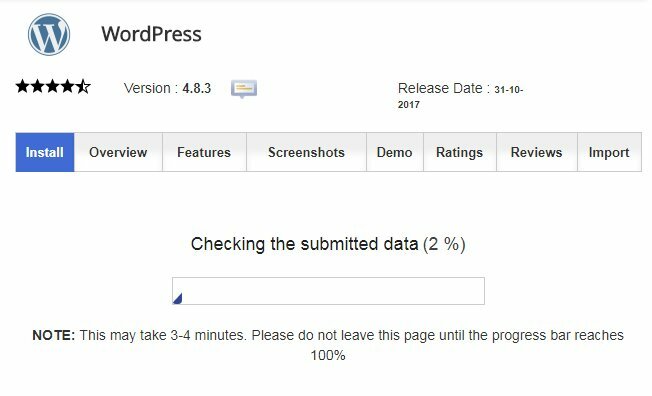 The WordPress installation process will start shortly and a progress bar should appear at the top of the page. Wait for the process to be completed. This can take a few minutes, but usually doesn’t take more than 30 seconds. 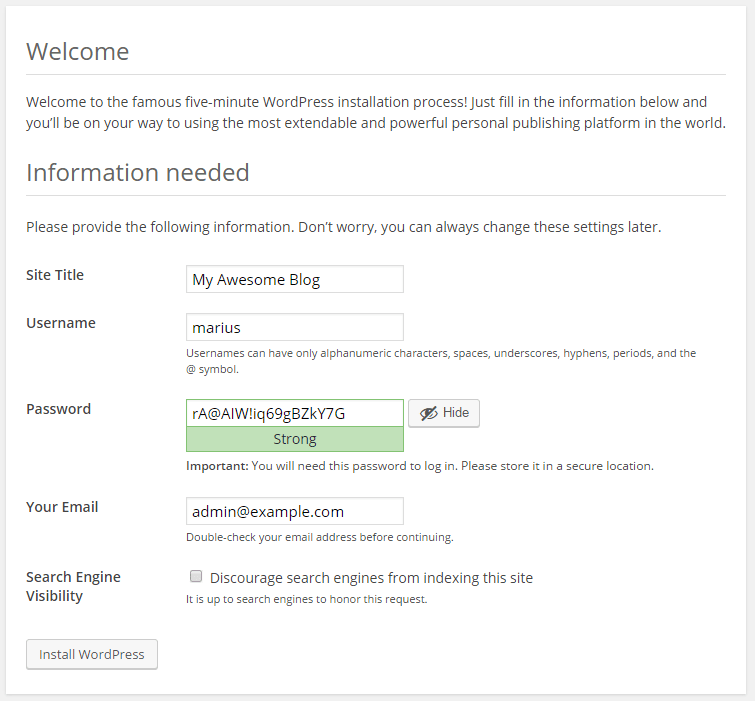 After WordPress is installed, you can log in to the admin area with the admin credentials set before the installation. Of course, replace example.com with your domain name. This is the second route to install WordPress. This approach does not depend if your hosting provider uses cPanel or not or if your web hosting plan includes Softaculous or another script installer. Every site is accessible via FTP (file transfer protocol) with an FTP client. 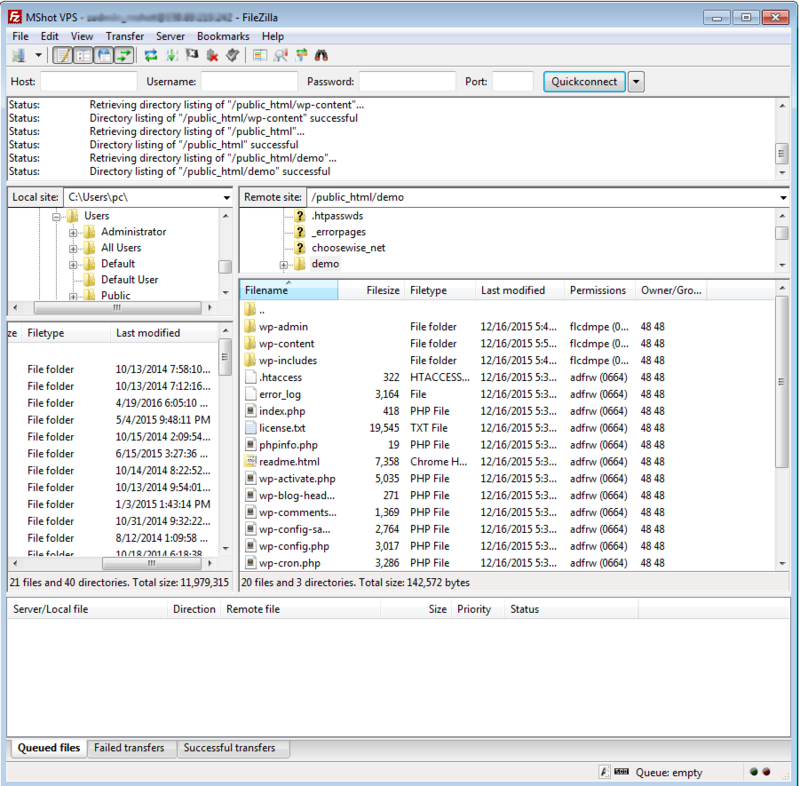 An FTP client makes a remote connection between you and your web hosting server and you will be able to manage the files stored on your hosting server with the help of the FTP client. To connect to your web server via FTP, you will need to install an FTP client to your computer, and you will also need your hosting account’s FTP credentials. You will usually receive the FTP credentials on email, right after you purchase your web hosting plan. You can also create additional FTP accounts from cPanel. There are a lot of FTP software to choose from, both free and paid, but the one I like and use for years is Filezilla. Filezilla not only is 100% free but also has one of the friendliest user interfaces from all the FTP software I ever used. It’s also available for 3 major operating systems, Windows (both 32bit and 64bit), Mac OS X and Linux. So, based on your operating system, choose, download and install a copy of Filezilla. In the Site Manager window, click on New Site and enter a name for your website (usually your domain name). Now, enter your FTP details in the right side of the site manager window. 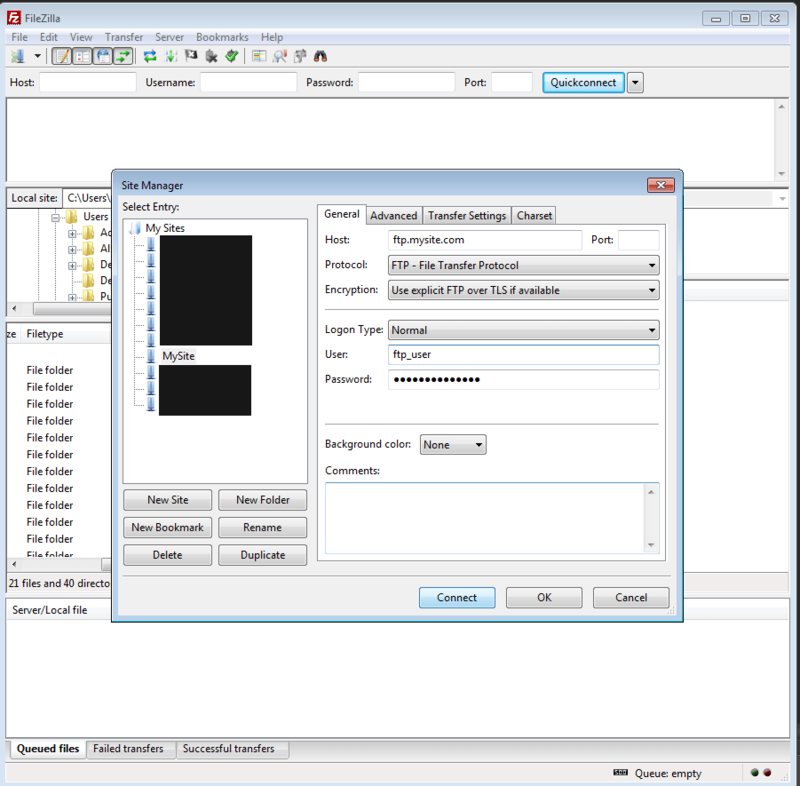 Enter your FTP User and FTP password and click Connect. 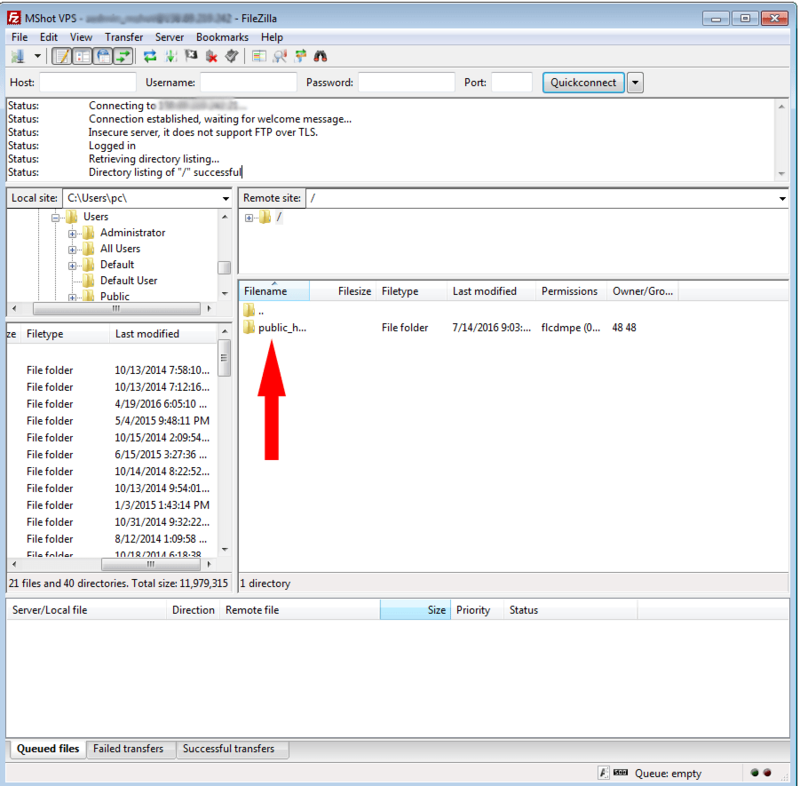 If your FTP details are correct, now you should see that FileZilla has successfully connected to your hosting server. Once connected, you should see the root folder of your web hosting account. It’s usually called “public_html“, but you can also find it named as “WWW“, “htdocs”, your site URL or other variations. Go to the WordPress download page and download the latest WordPress version to your computer. Extract the ZIP archive to a location where you can easily have access to it (such as Desktop), then open the newly created folder and enter the “wordpress” folder. 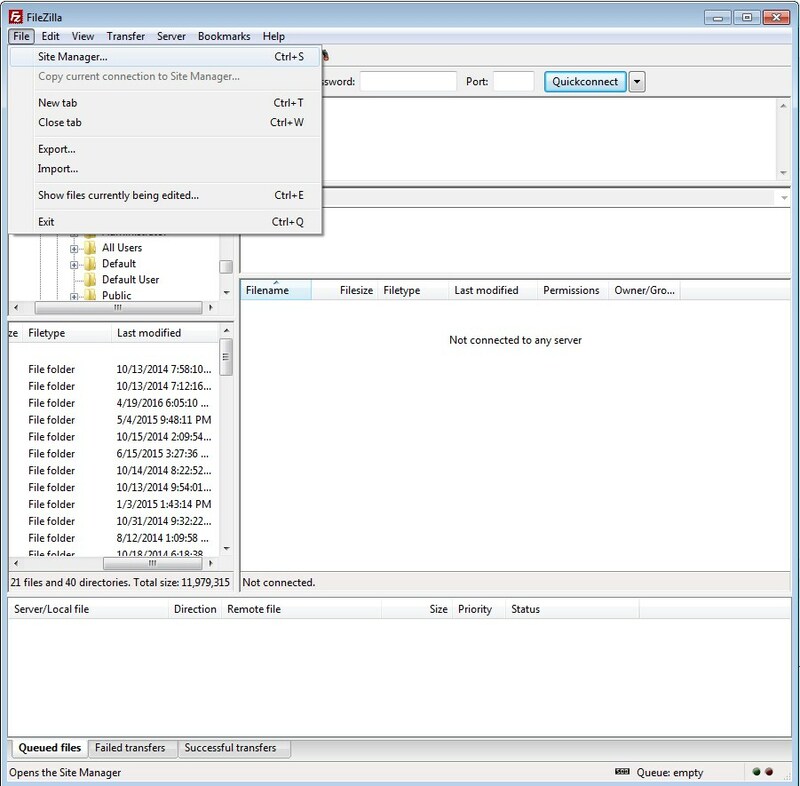 Select all the files and folders and drop them to your site’s root directory inside FileZilla. Wait until all the files were successfully uploaded. Now, inside the root directory, you should see a structure like in the following screenshot. Now that you have your WordPress files uploaded to your host, it’s the time to create a database from the control panel of your web hosting account. If your web hosting uses Cpanel as the user control panel, it’s usually accessible at http://www.example.com/cpanel, where “www.example.com” is your website URL. Depending on the version of the Cpanel, the panel interface might look slightly different than my screenshots, but the process will be always very similar. Once logged in to Cpanel, look for a “MySQL Databases” item under the “DATABASES” section. There, you will be able to create your database for your WordPress installation and WordPress will save all the blog data inside that database. Enter a new name for your database and click the “Create Database” button. Usually, your database name will be prefixed with your username or a part of your primary domain name. When you go through the WordPress installation process, you will need to provide the full database name (both the prefix + database name). After you have created the database, you will need to add a database user. You can do that from the same page where you’ve created the database name, from the section called “MySQL Users“. Enter the username, a strong password and repeat your password. Next, click the “Create User” button. Don’t forget to save your password, because you can’t recover it after. The last step of the database creation is to add your newly created user to the database created above. 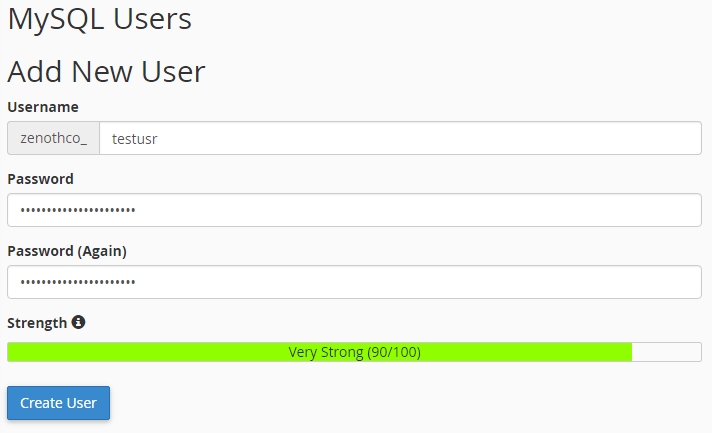 Therefore, from the “Add User To Database” section, select your user and database name and click the “Add” button. Once you have successfully created your database that will hold your WordPress data, you can proceed to the WordPress installation. To start the installation process, simply open your website URL in your web browser. 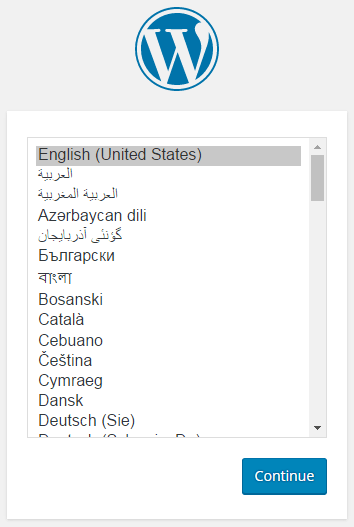 The first step will ask you to choose the language you want to Install WordPress in. WordPress comes from the start translated into all the major languages of the world. 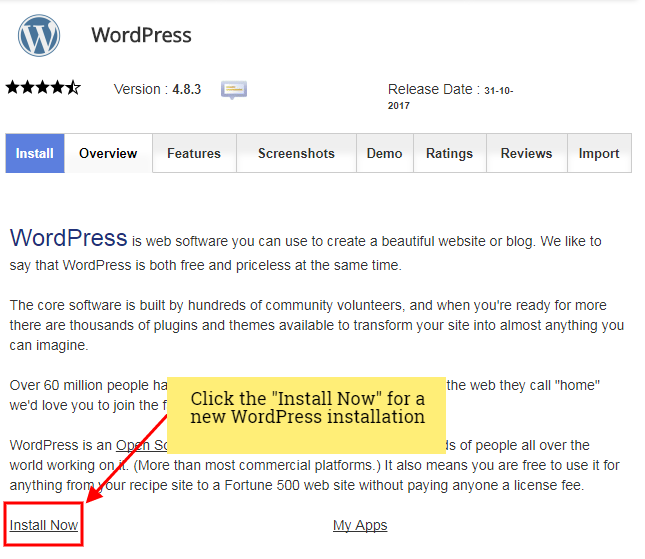 On the next page, you will see all the required information to install WordPress. Since you’ve already created a database and a database user, click the “Let’s Go!” button. Enter your previously created database name, database user, the database user password and the host. You should find out which is your database host in the same file or email received after you’ve registered your web hosting account. If you cannot find any references to it, you can try with the default value “localhost”, which will work in most of the cases. You can also optionally specify a custom prefix for your database tables. Click the “Submit” button to proceed to the next installation step. If the provided credentials are correct, you will see the following screen. 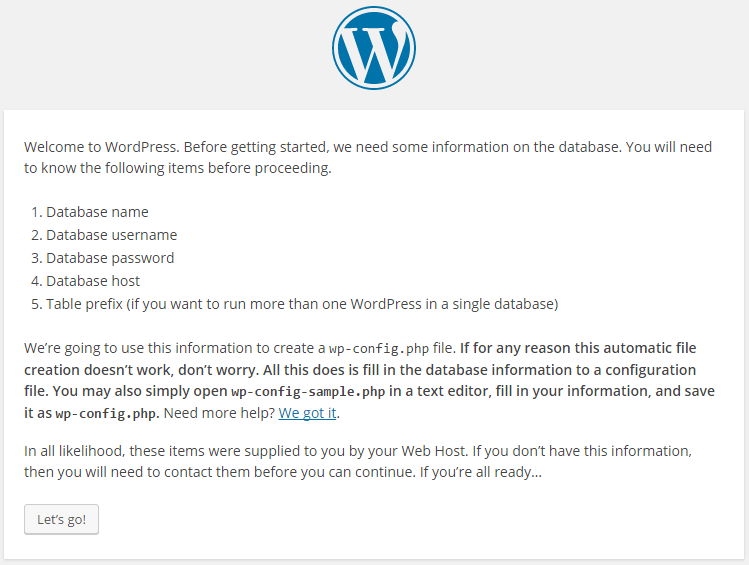 If not and WordPress cannot connect to the database, you will receive an error message. If everything is OK, click the “Run the install” button and fill up a few details about your site and administrator account. 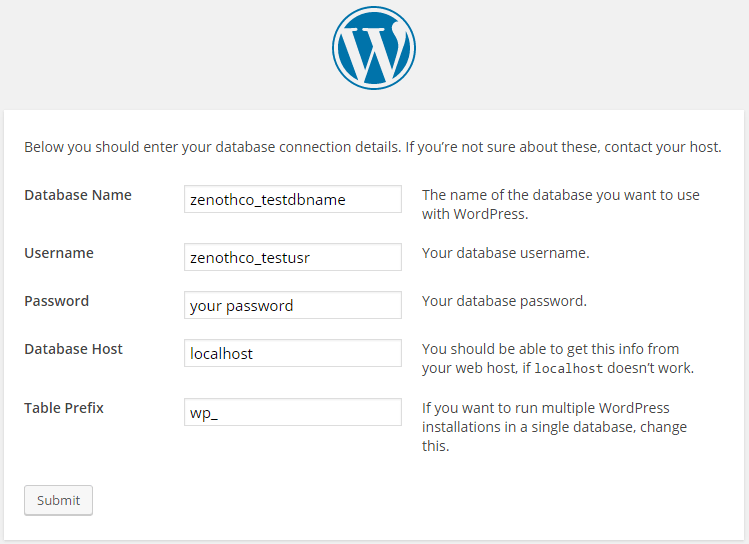 Click the “Install WordPress” to proceed with the installation of the database tables. If everything went smooth, you should see the login form, where you should now be able to log in with the username and password set on the previous page. Congratulations! You have now successfully installed WordPress manually using an FTP client. You have learned in this guide how to install WordPress from cPanel using Softaculous and also using an FTP client. If your web hosting has Softaculous available, use that approach since it’s much quicker. Otherwise, just install WordPress manually using FTP. In the next post, you will learn how to configure WordPress and how to prepare your site for adding content. Thank you, was extremely helpful. You’re welcome, Areefa. Glad you found the tutorial helpful. Glad you found my post helpful. Hello; thank you for your super clear instructions. I’m having some difficulties though. I’ve uploaded the wordpress files to public_html. And I’ve created the database and added a new user. But when I go to my website, I get a Not Found message. Analyzing the website URL provided for the comment, it looks like you have installed WordPress in a subdomain. I suspect there is a problem related to your DNS records and not a problem with your WordPress installation. Sometimes (depending on your web hosting provider), it might take some time after the subdomain creation to be able to see its content. There is also the chance that the subdomain was not configured properly after creation (a DNS record can be missing, or something like that). Otherwise, you should be redirected to the WordPress installation screen when you visit the home page of your subdomain. If your subdomain is configured properly and you upload a file named “index.html” to the root of that subdomain, you should be able to preview the content of that file in your web browser when you access the subdomain address. If you cannot see the content of that file, it means there’s something misconfigured with your subdomain or web server. If that’s the case, you can try contacting your web hosting provider support if you are on a shared or managed web hosting package. In the case your website is hosted on a VPS or an unmanaged dedicated server, it’s a bit more complicated since you need to find the problem by yourself. The information is complete and clear. He tried to follow the passages of this article and this video https://www.youtube.com/watch?v=SnB5lkcRRhA but I see that they have different steps. I am doing something wrong? The video you have watched teaches you only how to purchase a domain name and how to buy a web hosting plan, not to install WordPress. I have already covered these steps in detail here (get a domain name) and here (get a web hosting plan). A domain name and web hosting are required in order to install the self-hosted version of WordPress and only after you have a domain and hosting you can install WordPress as it’s described in this tutorial. The domain name gives your site an accessible URL (such as my domain name: antreno.com), while the web hosting hosts your site’s files and databases and makes them publicly accessible to the people who visit your domain name. If you want to learn all the steps for creating your website in the right order, you can also read my complete blog creation guide. I hope it makes more sense now.